Bethany was blessed in many ways in the year 2013 which seemed to go by so fast as a run away train. The May Communion meeting was blessed with good attendance in all the meetings with many visitors from our sister churches. Elder Josh Winslett was blessed to bring two timely messages on “Repent and be Baptized” and “Examine Yourself” which reminded us of the goodness of the Lord and our gratitude to Him which should be continually shown. 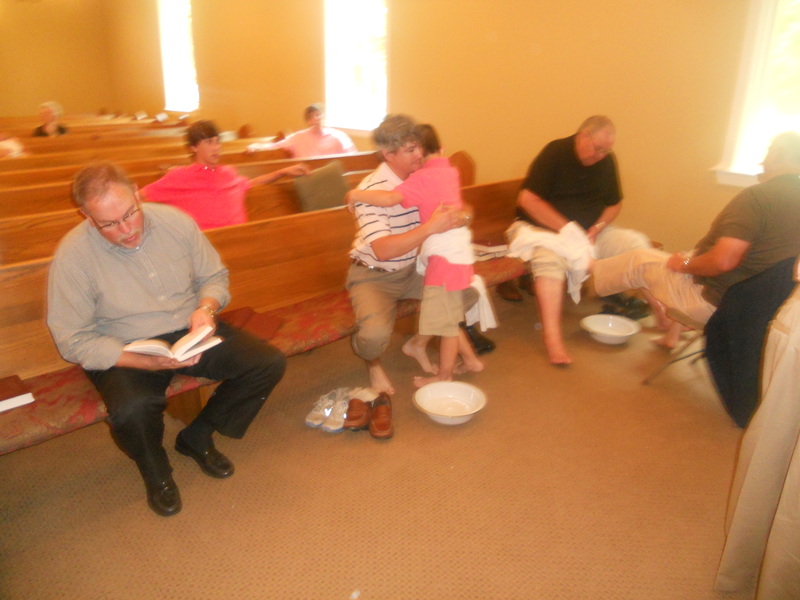 Father and son wash each others feet and other brothers in Christ. Surely the presence of the Lord is in this place. 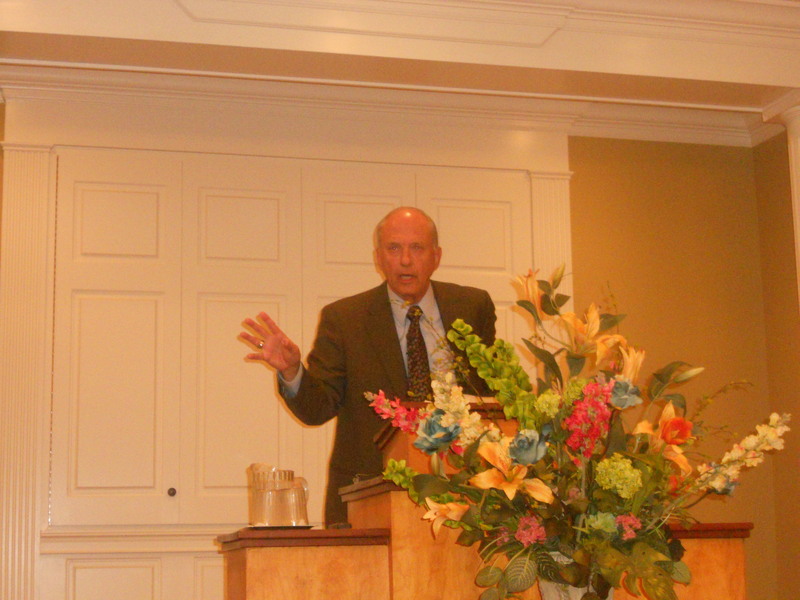 The Lord richly blessed with the annual meeting in September with Elder Ronald Lawrence from Nashville, TN who brought three excellent messages on “Job’s Afflictions”, “Troubled Heart” and “Enduring-Crowns”. We had large congregations, great singing, fellowship and food to accompany the preaching. Pray the Lord will bless again this year with a Spirit filled meeting. 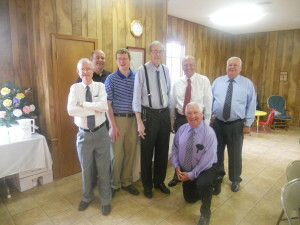 Preachers at our September meeting in the Fellowship Hall and one preacher in exercise mode.Elder Ron Cockrell has since passed away and enjoing a Heavenly Meeting. Sister Urea Wise celebrated her 93rd birthday in the Fellowship Hall at Bethany which was attended by all her family and many, many friend and neighbors who know and love her. We pray the Lord will continue to bless. On the downside of the year, Sister Sandra Wise lost her father, Winston Quarles, who passed away on February 14 from a hard battle with cancer and one of our members and also Elders, Elder Gene Browning passed away on November 10 after being in ill health for a number of years. These two dear brothers are missed by family and friends but are in the presence of the Lord they both loved. We also were saddened that Sister Tammie Wise was again diagnosed with cancer after having been pronounced cancer free a few months earlier. The cancer was extensive and she has undergone many chemo treatments which has made her tremendously sick. The first chemo got good results and we trust the last round will yield even better results. The church rejoiced to have Anna Lauren Parrish come forward on October 6 desiring a church home and forthcoming baptism. She was joyfully received and was baptized by Elder James Hall the first Sunday in November. We are thankful for her and pray the Lord will continue to bless as she goes forward in the service of God. Sister Deanna Wise Father, Dean Browning had major surgery to repair some hernias and repair from prior surgeries. 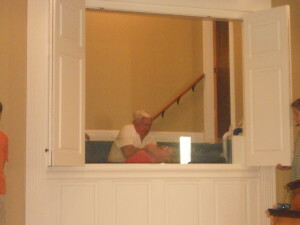 After an initial time of setbacks and pain, he is recovering very well and back in church for which we are thankful. Brother Jonathan Wise was given the job of Sports Editor of the Pontotoc Progress after having worked part time for two years as a Sports Writer for them. Everybody says that he is doing an excellent job. He continues to regularly fill preaching appointments in churches in the area. Brother David Wise officially got his license document as a Certified Public Accountant and is the manager of the Pontotoc office of the accounting firm of Watkins, Ward and Stafford. 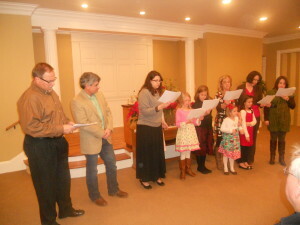 He also began introducing services at Bethany in October and had been blessed to bring some good lessons. He has filled one appointment this far at Yalobusha PBC while Brother James Hall was gone to Dubai. Brother James Hall and Sister Peggy Hall visited their son Michael and his family in Dubai for about three weeks the last of November and first part of December. They like it over there. 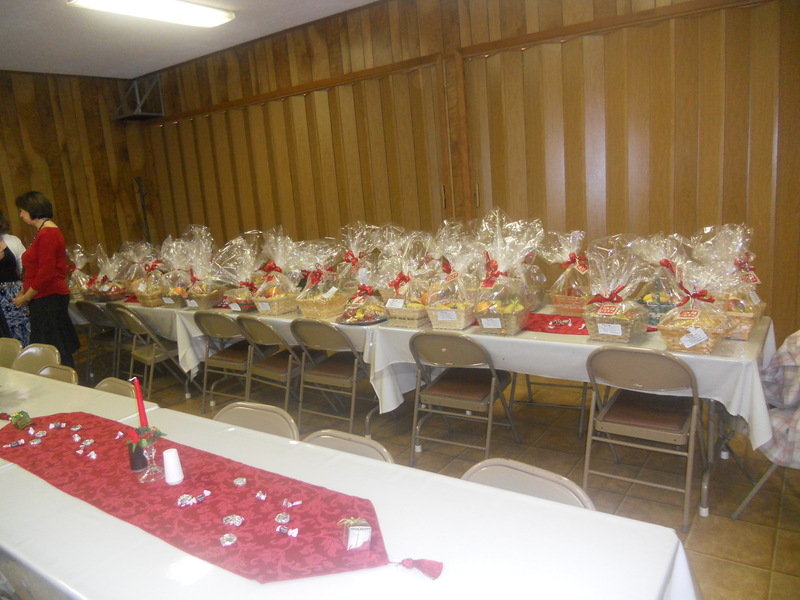 We have had many thank you cards for the fruit baskets that were delivered to various shut ins the first Sunday in December. We enjoyed a pizza lunch and then assembles the fruit baskets in the Fellowship Hall. Thanks to all who had a part in this worthwhile endeavor. 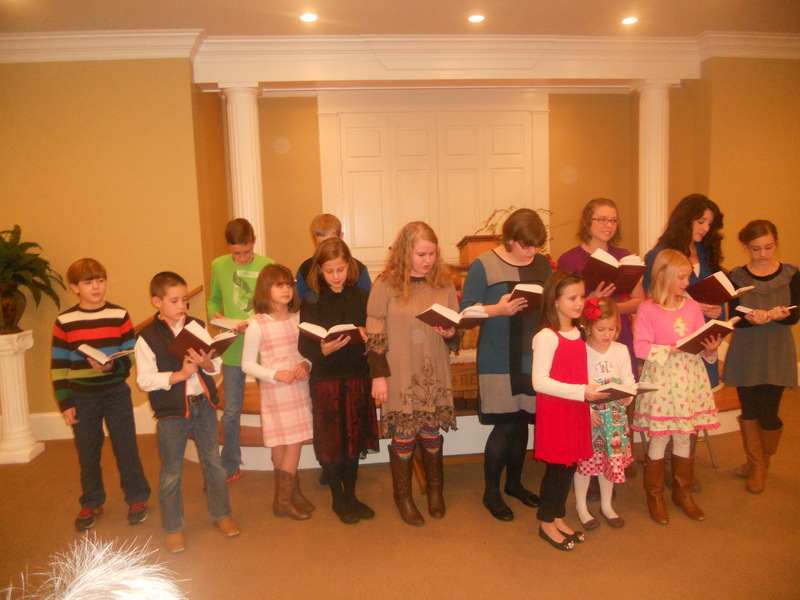 We had a great Christmas Singing the second Sunday night in December with the youngsters singing their special songs, some special music and congregational singing. 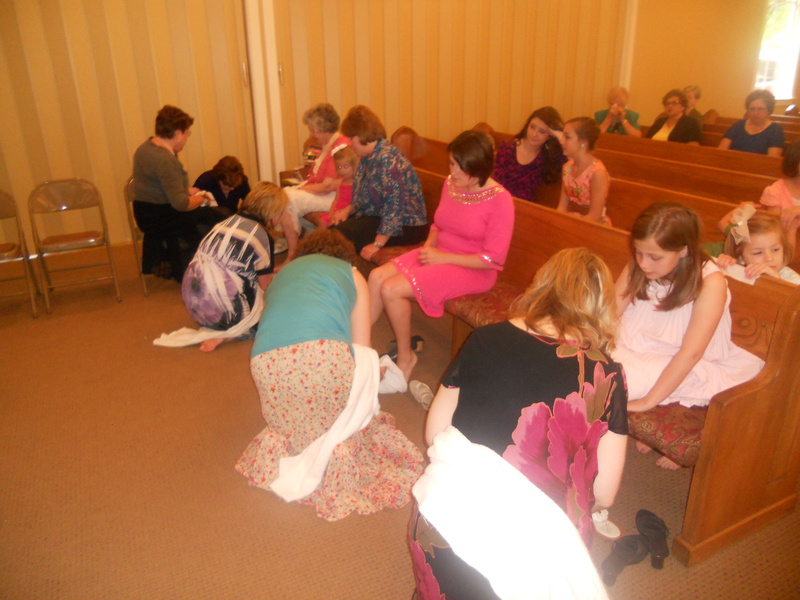 We had many visitors and a good congregation in spite of the not so favorable weather. “Make a joyful noise unto the Lord all ye lands. Come before His presence with singing and enter into His courts with praise. Brother Larry Wise fell on October 18 and fractured his shoulder and was in a sling for six weeks and although Drs say it has healed, he is still in a lot of pain and will be taking physical therapy to help alleviate this problem.